Blue is the colour. The website isn’t the game. So I may support Chelsea on the pitch, but on their website? Oh dear me. It’s as though they got someone who has just learnt flash to build it – to use as many flash animations as possible. And any website designer that incorporates a link on their splash page (why oh why a splash page) that says “check out the site demo” and a first message “learn how to navigate through ChelseaFC.com” needs to be questioned. Learn how to navigate a web site? Oh please! The nature of football fans is their brand loyalty, but to give them something that visibly takes time to load (page loading status bar), requires instructions to learn how to use, and doesn’t make things easy – support me achieve my goals – is frankly insulting. Meanwhile the community stuff that supporters care about (beyond the news and match reports, it’s probably going to be the most sticky content) is a seperate site that looks like it was built in the early days of the web. I mean, who uses frames anymore. Sorry Chels, poor show. Your league status doesn’t extend to your on-line prescence. Developers who no longer code refer to themselves as going “post-technical”. I’m never sure if this is a badge of honour or not. For someone who is pretty non-technical, I am delighted to announce that I’ve gone “pre-technical”. I’ve got an apache web server running on my local machine with a mySQL server all courtesy of the delightfully simple Apache Friends XAMPP. In only a few minutes I had it up and running (and after an internet basics 101 with Dan North) and a couple of clicks I’d installed WordPress on my laptop. I can now play around with different designs and start making this website exhibit the sort of production values that I strive for with clients. What’s the value in changing colour? And of the requirement to change colour on a site, in fact that whole customisation thing? Until recently I’ve never seen the value of it. After all, how many people have you seen with a personalised theme on their windows desktop, or even just changing the desktop background? One reason people don’t do this is because they are lazy. The call to action to change it is hidden behind a right click, and it’s not exactly straight forward to do. But there’s a bunch of new sites that challenge the user’s laziness. These seemingly pointless customisation features are part of the overall experience. And they work. And by doing that, they add value to the site. I go into a store and a salesperson helpfully shows me the product, but I’m not yet ready to commit. She offers me a great deal, I’m tempted, but I want to check it out on the web. She says “great!” scans the products and prints me of a personal card with a short unique identifier and a unique website URL. I search the competitors, the salesperson was right, she was offering me a really good deal. So I got to their online shop and enter the URL and there is the tailored deal that the salesperson told me about. It has even got her name on it (so I know he’s going to get some credit for the sale). I get through to the checkout screen. I enter my personal details and I’m just about to buy, but I’ve got a question about the terms and conditions so I take a pause in filling out the form. There’s a number on the website and I get through to the call centre. I don’t have broadband so I loose my connection. The voice at the end of the phone knows who I am and where I am up to. I’m ready to commit… but she apologises, she doesn’t have any in stock. I’ll have to wait seven days. But I could pick it up from the store tomorrow if I want (or even a store close to where I work) or I can get the store to deliver if that would be more convenient. I’m delighted. The next day I go to the store and it is waiting to me. The sales person smiles. She didn’t take my money, but she ultimately made the sale and she’ll be rewarded for it. Fantasy? It shouldn’t be. Thinking in terms of the customer experience and the customer journey is only the first baby step. The giant leap is to get IT bought into it and implement a solution that is not going to cost the earth and take years to (not) deliver. And that’s where ThoughtWorks comes in. We thrive on getting everybody together and using creative, collaborative and highly visual techniques we quickly get everybody to consensus on the vision we want to move forward on. Because we are an IT company, we understand the opportunities and constraints with technology. But most importantly because we use lean and agile techniques to delivering technical solutions we are responsive to change, flexible with emerging requirements and can focus on getting things done – the baby steps – whilst working towards the giant leap that will win lifetime value for customers. Hmmmm. That’s beginning to sound like marketing blurb. 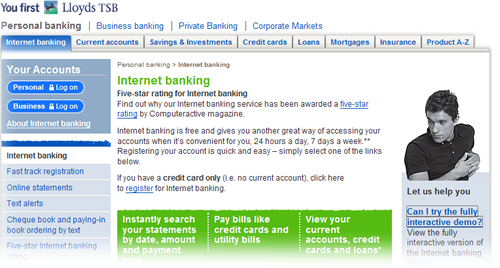 Taking a look different UK banking web sites a consistent theme seems to appear. There is a fundamental mismatch between public brochureware site and the secure transactional site. Banking brochureware sites are generally (but by no means universally) reasonably good. Their look and feel has evolved over time. No bank (yet) offers a web 2.0 look and feel but some get close. Lloyds TSB has a very clean and polished feel. 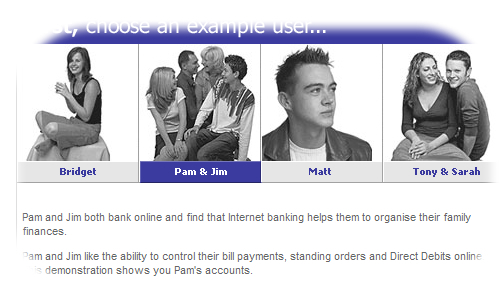 The LTSB site is customer focussed, indeed the “interactive demo” of their internet banking offering introduces different personas to explore different scenarios. Can we expect their internet bank to offer a compelling customer experience? To be driven around customer needs? Well maybe. But there is more to a compelling experience than just usefulness and usability. There is something about the aesthetic execution of the proposition. What it looks like. Attention to detail, creativity… sadly missing with the transactional site. Is it the case that the agency who worked on the public site went nowhere near the transactional site? Probably. After all the skills and ownership needed to build a website are different from those to own and build what is effectively a business application. The primary stakeholders in the public site are marketing; the primary stakeholders in the transactional site are IT and operations. Lloyds TSB are not alone. Smile are an internet bank. But take a look at their tables. In 2006 who still uses cell borders and padding? First Direct are another bank whose primary channel is the web. And yet they exclude more than 30% of customers who would wish to have a relationship with them but do not use the browser they choose to support. Barclays have got a great new brand that manifests itself on their public site, yet this has not worked its way down to their transactional iBank. Don’t get me wrong, iBank is pretty good (the interaction design was created by experts – ahem, I thank you – and was extensively usability tested. But this was in the dot-com boom times when we still had to get over fears over internet security). Yet six years later, apart from some changes to the stylesheet, little has changed. On the HSBC net home page they are almost saying our site is so slow you need to do something about it with your browser. My hunch is that there are a couple of things going on here. Firstly, most banks implemented their internet banking applications during the dot-com boom. They were as much a reaction to the times as a strategic imperative. being rushed out bolt-ons to legacy banking applications. Almost a decade later and little has changed. And where legacy systems are being overhauled – SOA are three big letters in the banking IT world, I wonder to what extent changes to the customer experience are tabled on the agenda. It makes sense for the brochureware site to be owned by marketing. With ownership marketing are free to choose a creative agency to implement a brand compliant look and feel. IT’s primary involvement in building anything was in commissioning the Content Management Solution (and updating the propriety software when the licences inevitably expire and the current version is no longer supported. The brochureware site can therefore evolve; it is probably built and maintained by people who understand the web. That is why these sites should by and large be cross browser and DDA compliant. So this brings me to my second hunch; the question of ownership. The public site is owned by marketing, the transactional site is owned by IT and operations. And their priorities are quite different. Whilst marketing people generally aim to have a polished look and feel, with a good attention to detail and an understanding of the customer intentions, the priority of IT is rather different. IT thinks in terms of requirements. And the look and feel is “gold plating” that is de-prioritised when deadlines slip. It is time to bring all the parties together. Anywhere large IT projects are on the CIO agenda, “Infrastructure renewal”, “Service Orientated Architecture,” “Legacy refresh” etc. These should provide the marketing organisation the opportunity to address the customer experience and refresh the interactive experience of the transactional web site. Bring it up to date. And maybe soon we’ll start to see Bank 2.0 applications. Hopefully sometime before Web 3.0 becomes vogue. Want to go on holiday to France. Want to take the car on a ferry. Want to sail to Cherborg, or St. Malo, or Le Harve, or Caen. Flexible about time. Looking for best price. Want to book on-line. These are my goals. Not unreasonable goals, although as soon as I add “I want to have a ticket booked within five minutes” I enter the real of dreams. Currently, it is not possible to realise my goals. That is the declarative paradigm that is conspicuous by its absence on so much of the web. Rather than flexibility, the ferry booking sites send me down an imperative, step driven journey. I cannot adjust my criteria without starting the process again- and that means re-entering all the data I have already provided. The story doesn’t end there. After fighting with a number of different websites I finally find a ferry crossing that matches my requirements. Condor Ferries. The price is alright – £160.00. I Don’t want to book it there and then, I need to confirm it with my wife. She says “OK” so I return to the site to find that the booking form has timed out. There had been no option to save the quote. I have to start again. I go through the process again to find the price has suddenly jumped from £160.00 to £280.00. Unhappy, I ring the company to be told their system has a real-time flexible pricing engine that changes according to demand. The price lower price is no longer available to me. (At least they didn’t have the cheek to put a premium for the booking over the phone rather than the internet). Indecisiveness gets the better of me so I put off booking till the following day. Once again I go through the pain of step-driven booking wizards. And lo-behold, the price has dropped again to £160.00. I started with some “wants” and I’ll reiterate them. I want a declarative web experience that meets my expectations and helps me painlessly realise my goals. I want travel booking forms to enable me to push and pull different levers to refine my choices, just like I can change fields on a spreadsheet. Finally, I want to be able to save quotes to return to them later. I don’t want the web to be like a high pressure salesperson who tells me this price is only available if I make a decision now.